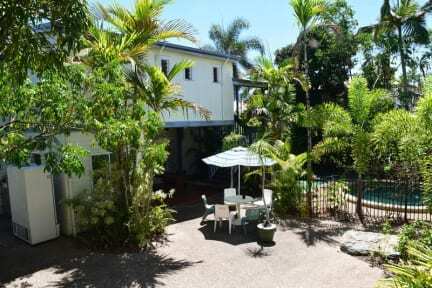 Geckos Backpackers is a Magnificent Historical, Heritage Place set amongst lush beautiful gardens. The buildings have very interesting Architecture of the Queenslander Style. Brilliant location, right next door to the Cairns Central Shopping Centre, including Coles Supermarket. 600 meters to the city centre and 800 meters to the superb Lagoon. Very peaceful, clean & spacious property with no bunk beds at all. Air conditioned rooms do not need coins to operate. Some rooms have ceilings up to 5 meters. 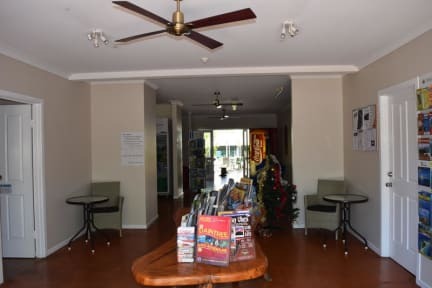 Well equipped kitchen open 24 hours with free tea and coffee, Tv room, small library, large size pool, laundry facilities and unlimited internet connection. Extensive Tour Desk where we can show our guests all the Tours/Activities in our Tropical Paradise. Reception hours are from 6.30am to 12 pm and 4pm to 7pm. Guests can still check in 24/7 swiftly and contact us for help 24/7 by ringing 1 of the 2 telephone numbers displayed at reception. One of the numbers is for Peter and the other is for the night caretaker. Great stay, the location is perfect and everything was clean. The Manager was very polite and helpful. The place was very quiet. NO ALCOHOL was a winner for me. Location was awesome. It was not “class” but it was comfortable and got the job done. Perfect for a quick overnight stay. Secure room, little noise, well-aerated rooms. Flexible check-in and check-out procedure, and staff friendly and helpful. Kids in the hostel, other guests and outside v noisy until late, we were given a sheet (no blankets) and woke up early absolutely freezing. Facilities good, only a short walk to town and shopping centre.